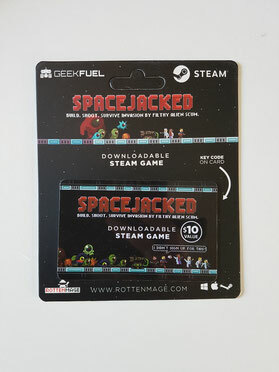 Last month we unboxed a try out of Geek Fuel. This month, we received the August box! The August box was the first XL box. And I was curious to see what's in it! Let's take a look. You can watch the video, or check out what's in the box below! Geek Fuel always includes a t-shirt in the box I really love that, getting a new t-shirt each month is great! Of course you'll have to wait and see what kind of t-shirt. But that's the fun part! I had a shirt sized L last month. Which didn't fit well. It felt like a size small. So I changed my size in my account. Apparently that didn't work out well, because I received another size large. But this time: It was fine. (And Geek Fuel offered send me another size). I do like the t-shirt a lot. But it's a pity that one size can differ each month so much. Once you've found the right size, you have to be able to trust that size will stay okay. (As long as you don't gain or lose weight of course haha). On to the t-shirt in this box! 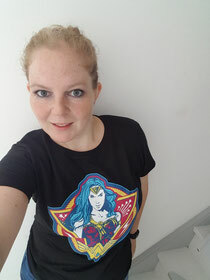 It's a Wonder Woman t-shirt. And I really like that! I'm glad it fits and I will definitely wear it. Another item that's always in a Geek Fuel box is the pin. Last box, I was wondering what it was when I found the pin. Now I know that the 'thing' from Epic Enamels is a pin! I had the pin 'Cybot'. And I have to admit that I didn't recognize it/ knew what it was. I recognized all the other ones on the flyer though haha. Other pins you could have gotten in the box are 'Superfuel', 'Bat Bot', 'Wonder Fuel', 'the Fuel' and 'Aquabot'. I always think pins are nice to have in a box. But mainly just okay. As an extra item it's fine. But I do prefer the other items :)! The BAM Box also had a pin every month. I have gotten some excellent pins there (love the Chucky and South Park pin I have). So pins can be awesome. I'm just more interested in what else a box has to offer! This is what made this box an XL box! Each box contained a super sized Funko Dorbz. You could either receive Rocket, Stay Puft Marshmallow Man, Ant Man, Big Daddy, Robin or Groot. I would have loved to receive Marshmallow Man. I did get Groot. Which is of course, also very nice! It's a nice item for this box. Now we're talking! I'm always excited to find a Back to the Future item in a box! I was really glad to receive this item. It's a traveler's luggage ID tag. I'll be traveling soon again and I can't wait to use this item! I love it. 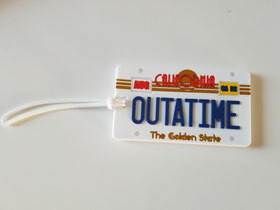 I already have a Back to the Future License plate in my living room. And I'm happy to also have a traveler's ID tag now. I love to take Back to the Future with me on my travels! This is by far my favorite item in this box! I know you see a lot of BTTF items everywhere, but I can't get enough! On the back of the traveler's ID tag you can fill in your name & address. Now I'll never loose my luggage! The game isn't my favorite part of the Geek Fuel. I still haven't tried the game from the last box and I'm not sure if I will. I just never play games on my laptop anymore. But the game does seem interesting. Maybe, just maybe.. I'll try.. I always enjoy watching your videos, plus this unboxing! I wonder why it seems we dont have a subbie box for geek here in Manila. I know we have huge grek market here. Boxing was really amazing !!! 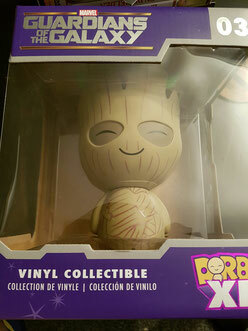 especially Guardians Of Galaxy -Funko Dorbz is so cute . By the way if you are not downloading that game you can share it with me !! !